George Bernard Shaw's Saint Joan, which doesn't get too many productions, has found its way to a Broadway staging thanks to Manhattan Theatre Club. While it's always a welcome treat to see plays featuring strong women characters on Broadway, Shaw's 1923 work about the 15th-Century religious martyr might not be the best choice. Most of its stage time, like most plays, goes to the men. Whole scenes feature the men talking about Joan or reacting to Joan, but not much time is given to the development of the character of the religious martyr who later received sainthood for her efforts to lead France to victory over the English during the time of the Hundred Years War. Played here by Condola Rashad, and directed by Daniel Sullivan, the "Maid of Orléans" comes off as somewhat dimwitted and an unfortunate religious zealot. The drama starts when Joan believes she hears the voices of saints Margaret and Catherine, as well as the Archangel Michael, telling her to crown the Dauphin (Adam Chanler-Berat) Charles VII at Reims. Robert de Baudricourt (Patrick Page) and his steward (Robert Stanton) finally are convinced their chickens won't lay eggs until she gets her way. She leads an attack with Dunois (Daniel Sunjata), who becomes a supporter. Her victories prompt discussion among others, including the Earl of Warwick (Jack Davenport), Chaplain de Stogumber (also Stanton) and the Bishop of Beauvais (Walter Bobbie, marking the theatrical director’s first return to Broadway as an actor in more than 20 years). The only explanation for her success is that Joan is a witch, de Stogumber concludes, and the poor girl, at only about 19 years of age, is burned at the stake. The two hours and 45 minutes drags mostly because of all of the men talking about and around Joan. I wanted to know more about her. An illiterate, poor country girl who suddenly feels called to lead the armies of France -- and in soldier's garb (Costume Design is by Jane Greenwood)-- is kind of interesting. Or should be. How did she come to believe the voices were real? With whom did she first share the knowledge? Even though she vows to be obedient to God's calling, are there moments when she doubts? Does she regret her decision never to marry? Was there a young man she ever had hoped to marry? Had she ever hoped to have children? I am certain marriage and children certainly had been part of the hopes of a young girl in 1500s France, so how did she cope with that loss? How does she develop the skills necessary to survive on the battle field and to inspire her troops to battle? How does she keep the men's spirits up in the face of defeat? Why does she suddenly decide the voices have been wrong and recant her testimony? Any of these questions might have been further developed to give us a heroic woman character with many layers and depth of emotion. Instead we are left with woman developed just enough to fuel conversation for the male characters. Meanwhile if you are wondering whether color-blind casting works here to have an African-American play Joan, I would say yes, without a problem save one line of dialogue that gives us pause. Rashad makes the character -- what there is of her, that is -- her own. A better choice would be to find one of the many plays written by women about women heroes out there and produce that one. 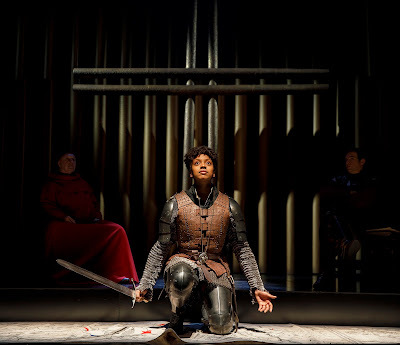 Saint Joan plays at the Samuel J. Friedman Theatre, 261 West 47th St., through June 10. The design team includes Scott Pask (scenic design), Justin Townsend (lighting design), Obadiah Eaves (sound design), Christopher Ash (projection design), Tom Watson (hair and wig design), Bill Frisell (original music), Deborah Hecht (dialect coach), and Tommy Kurzman (make-up design). -- No content notes, but I would say this is not going to be for younger kids.